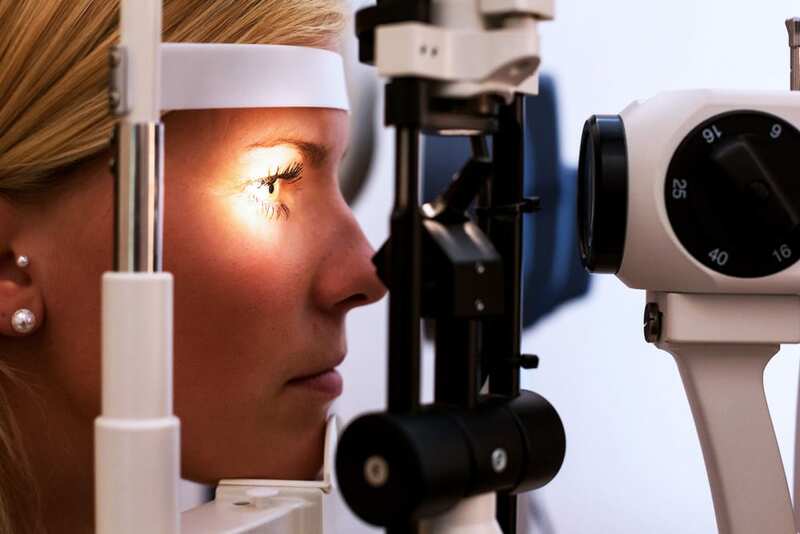 For a routine eye examination, a complete vision and ocular health assessment will be performed. Annual eye and vision examinations are an essential part of preventative health care. Optometrists are primary care health providers who can help diagnose and treat eye conditions before they become a problem. Many eye and vision problems have no signs or symptoms and if left untreated, can pose a serious problem to vision and health. Early diagnosis and treatment can maintain good, healthy vision and prevent vision loss. This test is usually part of the routine eye exam and is the best way to test for macular degeneration, cataracts, glaucoma, retinal disorders and general health problems (hypertension, diabetes, etc.). It uses dilating eye drops to enlarge the pupil to allow the doctor to obtain a wide view of the back of the eye (retina). The effects of the eye drops are light sensitivity and some blurred vision that can last for 3-4 hours. We recommend patients wear sunglasses on the way home; however even with dark sunglasses driving on a sunny day may be very difficult. Having a driver with you or taking public transportation is the safest strategy. This is a computerized test to measure central and peripheral visual fields. It is usually performed for detection of glaucoma, optic nerve disorders and neurological conditions. This allows your eye doctor to evaluate the health of the back of your eye, the retina. It helps to detect eye diseases, and allows documentation of the health of the retina, optic nerve and other retinal structures. Many eye diseases, if detected at an early stage, can be treated successfully without total loss of vision. This picture clearly shows the health of your eyes and is used as a baseline to track any changes in your eyes in future eye examinations. We are highly trained in providing both pre and post-operative examinations for LASIK, PRK and Refractive Lens Exchange. We work closely with surgeons and can provide all of the information necessary to help you understand the surgery. Refractive surgery eligibility can be established during the comprehensive eye exam. The risks and benefits of the latest technology will be communicated so the patient can make an informed decision. Dr. Hershorn continues to remain on the cutting edge of contact lens technology. People with astigmatism, bifocals, and other unusual prescriptions can now wear contact lenses as well. If you are considering contact lenses, quality care for your eyes should be your top priority. Safe, proper fitting lenses should never be sacrificed for a bargain price. This test uses ultrasound to accurately measure the thickness of the cornea. It allows a more precise reading of the intraocular pressure (IOP) when testing for glaucoma and aids in assessing the suitability for laser correction. An OCT is the latest advancement in imaging technology. Similar to ultrasound, this instrument employs light rather than sound waves to achieve cross-sectional, three-dimensional images of the structural layers of the retina and optic nerve. These detailed images are revolutionizing early detection and treatment of eye conditions such as macular degeneration, glaucoma, retinal detachment and diabetic retinopathy. An OCT scan is a noninvasive, painless test. It is performed in about 10 minutes right in our office. Feel free to contact our office to inquire about an OCT at your next appointment. This means that diseases and conditions can be detected years before they would have shown up during a regular examination. For an exam that goes beyond just a glasses prescription, our office has invested in an OCT.
Dry eye is the result of insufficient tears needed to lubricate the eye. Tears are essential for maintaining eye health and to provide crisp, clear vision. Dry eye is a result of the body’s inability to produce enough tears or stable tears. Our doctors are trained to diagnose and treat all types of dry eye. The treatment options include punctual plugs, steroid eye drops, antibiotics, Restasis, and in office gland expression.